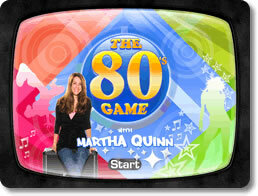 The 80's Game with Martha Quinn Game Review - Download and Play Free Version! Take a fun trivia trip back to the 80s, hosted by your favorite 80's VJ, Martha Quinn! 4 different modes of trivia, including a versus mode. You get to pick your 'inner 80's' character. Tough questions keep the game fun and challenging. Even the easiest questions posed can be difficult. The game is limited to an older audience because all of the questions pertain to the 80's. We don't have the PC download for this game any more but you can play it online for free at BigFishGames! Totally fun 80's trivia challenge! Can't get enough of the 80s? Consider yourself the guru of 80s trivia? Interested in taking a trip down memory lane? If so, look no further - The 80s Game is for you! The 80s Game includes several different modes of play to keep things interesting. Challenge Mode - See how high a score you can get in a limited number of questions. You always have the option of answering easy, medium, and hard questions that give you various points. Name the correct year the answer to the question occurred and you get double points for that round. Episodes - Answer 10 questions in different 80s categories like 80s Gals, Tom Cruise, 1 Hit Wonders, Politics, and Sitcoms. Which category will be your strength! Versus - This is where you can challenge a friend to see who is the true 80s expert. Time to decide once and for all! The 80's Game with Martha Quinn will bring out your inner 80's persona as you answer tough pop-culture questions vying for the top score. The game starts with a dialogue from former MTV video jockey Martha Quinn, in which she explains the game and asks you to pick a character from the 80s (John Mcenroe, Molly Ringwald, Run DMC, etc) that you identify with. Quinn explains the four different trivia modes and the game begins. The 80's Trivia game tests your knowledge of music, movies, and television shows among other things. There are four game modes in this game: Free-play, Challenges, Episodes, and Versus. In Free-play you will face a random sprinkling of 80s pop-culture questions. These questions may consist of answering questions from the show “Different Strokes” or song titles from Paul McCartney and Stevie Wonder. With each question you are presented with two options. You can select that you know the question right away or you can admit to guessing and guess at the answer. If you don't guess you are rewarded with bonus points, however, if you answer wrong you lose the point without a second guess. Admitting to guessing gives you unlimited chances at answering the tricky questions, however, you are subject to earning less points. Challenge mode gives you a limited number of turns to earn a high score. You have the option of facing a hard, medium, and easy question each turn, which give you different points depending on the difficulty. After each question is answered successfully you are asked what year the answer you've given took place in. If you answer this right you are awarded bonus points, increasing your overall score. Episodes is a category based mode. You answer 10 questions from varying categories like 80s Gals, Tom Cruise, 1 Hit Wonders, and Politics. The layout of the game is the similar to both Challenge and Free-play in that you are given the option to guess and if you get the question right you have to answer the year. Versus mode is the last option of play. In this mode you can challenge a friend to see who is the true 80s expert. There is no online option in the versus mode, which would strengthen the game immensely, but it is fun none-the-less to compete against your friends. The only real drawback of this game is how specific of an audience it addresses. If you weren't born in or before the 80s you'll have a really hard time with this game. You might even have to look up who Martha Quinn is because her significance, like the significance of most of the questions, is only relative to the 80s. If the easy questions were easier or were more significant throughout time, this game would be better for the masses and less niche specific. Overall, The 80's Game is a well-done take on trivia. 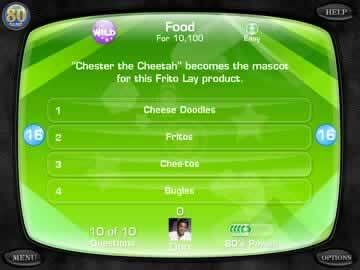 The questions are challenging, but the option to guess keeps the game exciting even if you don't know the answer. If you love trivia and lived through the 80s this game is perfect for you. Despite not having online capabilities this game is worth playing.